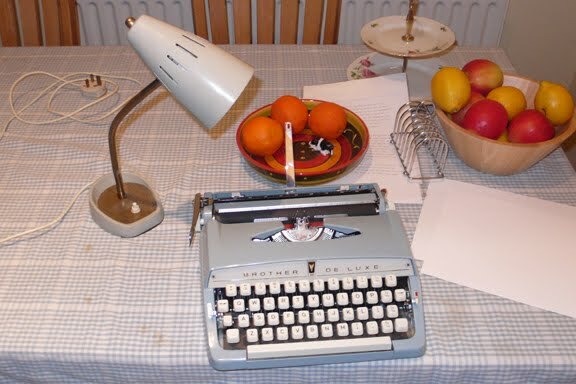 I recently bought a beautiful 1960s portable typewriter. Last night, on my drive home, I remembered a desklamp that belonged to my grandfather. The lamp is a classic 1960s brass bending stem. I thought it would go with the typewriter perfectly. Up to now it's been used in my workshop to light my drillpress. I brought it in last night. It's got a little corroded and the brass has all faded. After looking at the typewriter and the lamp I decided it would look so cool if they matched. So came into being my new do-it-up project. 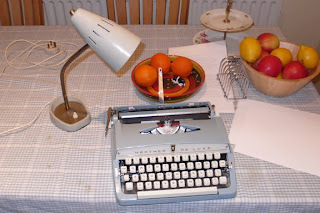 I'm going to strip the lamp and spray it the same colour as the typewriter. I don't why, but for the last while I've become really nostalgic about my grandparents house. It's resulted in me spending a fortune on Ebay, buying up a lot of the things we let go when my gran died.